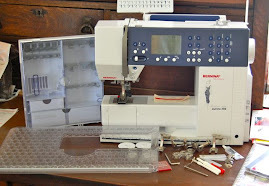 The bias binder is very easy to use when putting your quilt binding on, especially when you want quick work of it by machine, and not by hand. I always hand sew my very special quilts, but this handy attachment foot is wonderful for everything else. I begin at the bottom of my quilt (just a preference) in about the middle, leaving a bias tail of about 6 inches (again, just a preference for the final step of sewing my binding together). When you come to a corner stop about 1/2" away - the size of my bias tape. Raise the needle and pull the foot away from the edge. Swing the quilt around so it is fairly even with the foot (in the direction you are now sewing). Ensure the bias tape is still inserted correctly in the foot. The next step is just manipulation of the corner. The more times you do it, the faster you get. 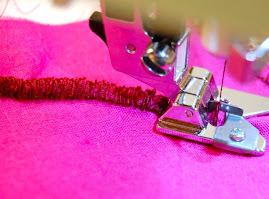 You want to pull the fabric next to each edge; having your corner protrude up.I will place a clamp (or a pin) just to hold the fabric below the needle in place - not actually necessary. Again, after several times of creating your mitered corner you will have this down. At the corner, fold your fabric up - like a teepee. Then fold it up as shown in the next photo. 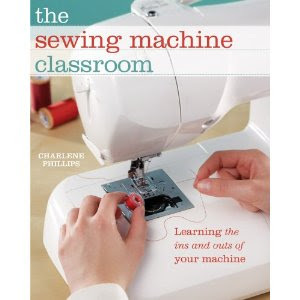 You are now ready to move the foot back into place and continue sewing the binding on. 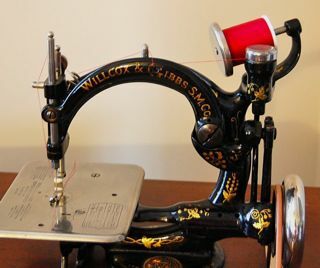 Continue sewing until you come to your next corner and repeat the process. It does get much easier each time you do this. You might even find an easier and faster method. Let me know if you do and I will share with others! You can download a copy of these instructions, complete with the photos from my web site www.thesewbox.com. 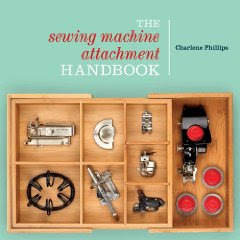 The direct link is Tape Stitching Bias Binder - Turning Corners. I just purchased this foot from my LQS. I am so confused at how to do the mitered corners. Do you have a video explaining this step? It is a bit confusing and photos just don't do it justice. I am presently working on videos, but haven't got to the point yet of publishing them. I will get to this one next though since you have requested and see how quickly I can get to it. Thanks so much for checking. Finally - instructions for the corners - BUT - how are you then going back and finishing those corners? 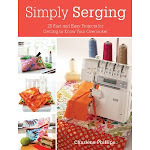 It appears you give the the extra fabric for the fold, but skip over sewing it. How do you finish it off after the rest of the binding is sewn on? I go back and do a quick hand stitch of the corners. Doesn't take long. Thanks - do you somehow tuck it in to still create a mitered corner? 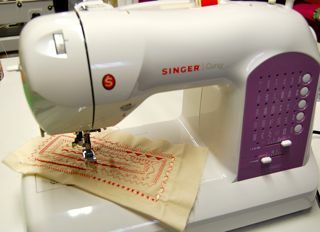 I just bought one of these feet to go with a new machine and, as sewing the binding is my least favorite part of quilting, I am looking forward to a speedier - and still reasonably attractive way to get them done! After following the process, the corner stays mitered (which is the purpose). The little bit left unsewn, I sew by hand. Best to grab some scraps and some binding and practice. Gets faster every time! I just got my adjustable bias binder foot and after a lot of mistakes and frustrations, here's what worked for me: I overlocked around the entire potholder (that's what I was making), making it easier to fit the project in the plastic part of the foot. I sewed all the way to the edge of the project, back stitched and cut the thread. Next I lifted the presser foot and pulled the project about an inch down, so just bias tape was in the foot, turned the potholder and reinserted it in the foot between the bias tape. Once I finished going around the whole project this way, I sewed down the inch of unfinished binding left at each corner with my normal presser foot. Overlapping the edges of the bias tape took a little wiggling, but the corners were perfectly mitered - actually better than when I've mitered corners by hand!